You need to get inside your image and look at its guts with the Photoshop Elements 11 Histogram panel — and keep it onscreen so that you can see its constant feedback on your image adjustments. One of the first things you want to do before you make any color or tonal adjustments to an image is to take a good look at the quality and distribution of the tones throughout your image. 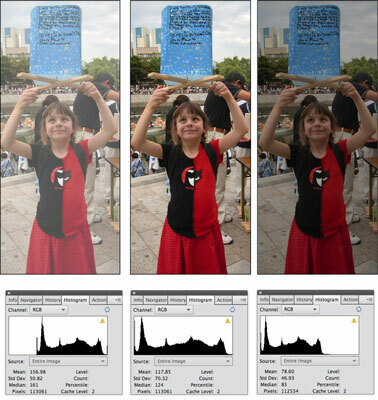 A histogram displays the tonal range of an image. It shows how the pixels are distributed by graphing the number of pixels at each of the 256 brightness levels in an image. On this graph, pixels with the same brightness level are stacked in bars along a vertical axis. 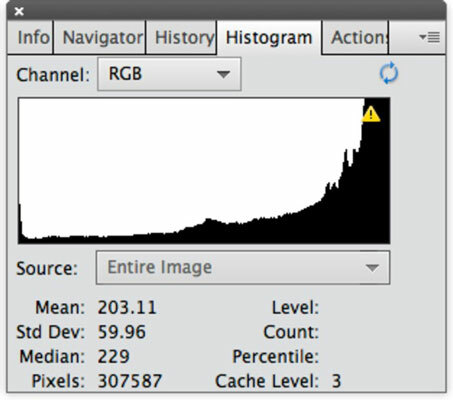 The higher the line from this axis, the greater the number of pixels at that brightness level. You can view the distribution for the entire image, a selected layer, or an adjustment composite. 1Choose Window→Histogram to bring up the panel. 2Select your desired source of the histogram’s display from the Source drop-down menu. Entire Image: Displays a histogram of the entire image. 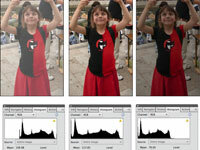 Selected Layer: Displays a histogram of just the selected layers in the Layers panel. 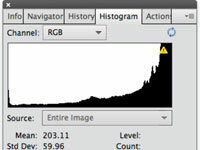 Adjustment Composite: Displays a histogram of a selected adjustment layer and all the layers below it. 3Select an option to view isolated portions of your image by choosing an option from the Channel drop-down menu. RGB: Displays a composite image of all color channels — red, green, and blue. Red, Green and Blue: Displays the histogram of each individual color channel. Luminosity: Displays the luminance, or intensity, of the RGB composite image. Colors: Displays the composite RGB histogram by color. Red, green, and blue represent the pixels in each of those channels. Gray represents the area where all three channels overlap. 4Examine the tonal range in the histogram. An image with good tonal range displays pixels in all areas. An image with poor tonal range has gaps or slopes that lean heavily toward the right or left sides in the histogram. 5(Optional) If you’re into numbers, check the statistics to evaluate your image. Drag your cursor within the histogram to see the statistics about a range of values. Or position the cursor within a specific area of the histogram that interests you. Some statistics, such as Standard Deviation, may be for those who live in the mathematical land of statistics. But you may discover useful information from the other statistics that can help you in your image-adjusting tasks.